As often is the case, our time in Italy in 2009 was fractured into small chunks. First, when we arrived back in Europe in March, it was just an overnight stay near Venice. Then in early May, it was a mere week as we made our way from Montenegro to Pisa for our flight to Malta. Late May and June would see us crossing back and forth between the western Alps of Italy and France several times. And come July, we'd settle-in for weeks of hiking in the eastern Alps of Italy, the Dolomites. Between our extended 6 week visit in Montenegro and our 10 day visit to Malta, Map Man had a only week to get us from our Adriatic port of Bari on the east coast of Italy to Pisa which was on the west coast and quite far north. The easy way would have been to cruise north along the Adriatic coast and then cut-over to Pisa by train to make our flight. Roman ruins aren't always this tall or idyllic. But the lure of mountain views and unfamiliar Roman ruins had us choosing the more difficult inland route to Pisa. Time spent resting my injured shoulder in Montenegro meant that we couldn't make the journey by bike in the remaining week regardless of the route chosen, so we opted for the more scenic though more mountainous course. Isernia was one of the unexpected finds along the way. I found myself immediately raving about Isernia and wondering why it wasn't on the tourist route. The siting of its stone old town on a wedge-shaped promontory told volumes about the longstanding need of villages to strike a defensive posture. The rocky precipices on either side literally came to a point and the town's people built their village to the very edges of these steep faces. The commanding views of the distant snow capped mountains and the lush, nearby hills added a sense of grandeur and safety to that of history. Lonely Planet's comments about Isernia reminded me of just how subjective everyone's assessments can be--how influenced we are by chance circumstances and context. I found Isernia to have a powerful sense of place and sense of history; they instead commented that there was little left to see of the old town damaged by earthquakes. They went on to preface their hotel recommendation with "....if you have to stay the night..."
I appreciated that Isernia's shop windows were changing with the times but that the narrow winding alleys and steep streets gave one a sense of by-gone days with every step. But as I walked I realized that Isernia was one of hundreds of such villages and there was little more content here than the sense of a typical Italian old town to draw most tourists. 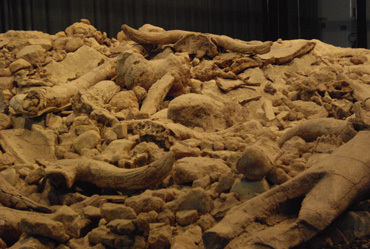 Massive "middens:" butchered bones from 730,000 bp. Bill directed us to less-traveled Isernia because of our delight in museums that are definitely on the "ho-hum" scale for most travelers. Somehow the tumbling together of our science backgrounds with exposure to European history while traveling resulted in us being fascinated by the prehistoric era instead of the times of discovery and invention that surrounded Galileo and daVinci or other eras. So Isernia drew us in with its single claim to fame, which is about as prehistoric as it gets: a bone heap found at the nearby La Pineta site dating from 730,000 bp. Our electronic Encyclopædia Britannica describes the bones and tools as the "earliest securely dated material" of hominids in Europe (pre-pre-Homo sapiens). No hominid bones themselves have been found but it's presumed to be a Homo erectus site because of the butchered bones and stone tools. Additionally, there are burnt clay bits that suggest a controlled use of fire by these hunter-gatherers. (Homo erectus had a brain about the size of a modern 1 year old child). 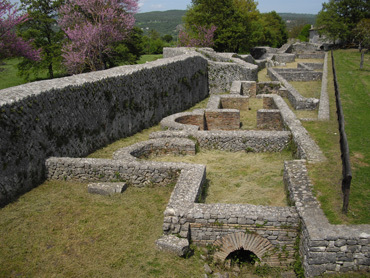 A run of city wall and foundations at Roman Saepinum. Our visit to Isernia was one of those museum visits that is like watching a stage in the Tour d'France: you spend days getting to a place for an experience that lasts a couple of minutes. But if you are lucky, that fleeting experience satisfies a deep need to have been there, to have seen it for yourself. And like with any such events with silly cost-benefit ratio's, we milked it for all it was worth. We lingered in the little museum to take in all that we could from their limited but profound archeological finds and used their exhibit labels to expand our Italian vocabulary. 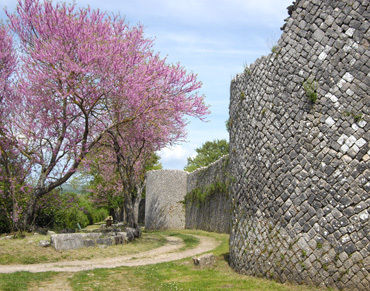 Bill managed to pull together a just-workable bike-and-train combination that allowed us to make a day trip to Saepinum, an old Roman town near Isernia. Lonely raved about it as being one of the best preserved Roman cities in Italy, but in my mind the author seemed to have forgotten about Pompeii and Herculaneum, which are in a whole another league. We enjoyed Saepinum as much for the pleasant park-like ambiance on a hot day as we did for the ruins. It was a nice outing though the site itself wasn't dazzling. 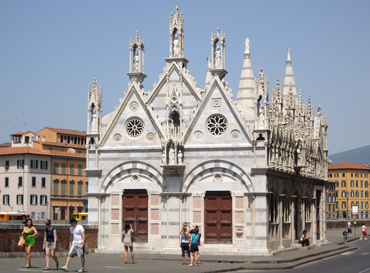 Taking time out to visit these ancient historical sites meant that we had to take a train a few more miles into Pisa than we would have otherwise but we enjoyed the pleasant mix of biking and sightseeing along the way. As planned, we arrived in Pisa 2 nights before our flight so we'd have time to buy an inexpensive suitcase for the side trip to Malta. Once our gear was sorted into "Stay with the bikes" and "Go with us" piles, we walked into Pisa for a little sightseeing in a famous city we'd visited before. Oops! 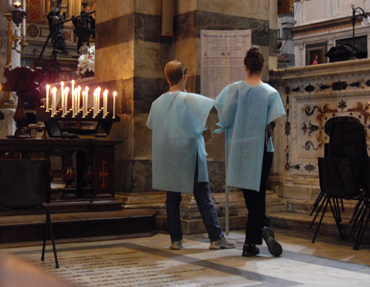 Their bare shoulders weren't welcome in Pisa's Cathedral. After returning from Malta I began my reconditioning program again on May 25--for the 3rd time in 2009. We headed out on bikes from Dubrovnik, Croatia 2 months earlier woefully out of cycling condition because of our busy time back in the States. We slowly rebuilt our strength in the headwinds and on the hilly roads of Montenegro for about 10 days and then comfortably settled in to our cycling routine. But less than a month into our touring season I partially or fully dislocated my left shoulder, necessitating a 12 day lay-over to let it stabilize. A very Pisa-esque little church along Pisa's Arno River. After my injured shoulder could tolerate the stresses of riding, the requisite 10 day re-conditioning regime was begun again with the added caution being needed for my still severely compromised shoulder. And then in early May we voluntarily hung-up our bikes for about 2 weeks as we made a non-biking trip to Malta. So, for the 3rd time, my reconditioning program was kicked-off, still being modified for a vulnerable and cranky shoulder as we headed west long the coast from Pisa. We knew a 4th reconditioning interval would start in late July after a several-week break from cycling for hiking in the Dolomites. I always dread reconditioning because it feels so nasty and this year the ratio of reconditioning time to being conditioned was weighted the wrong direction. My body complains endlessly about the effort involved in regaining my fitness. For 10 days I get a stream of erroneous messages stating that it surely must be time to eat/drink/pee/rest/stop. I look at my watch repeatedly, beginning a few minutes into the day's ride, and after most looks I have to settle for pressing on instead of bowing to the pressure. The grim reality is that training requires pushing beyond one's comfort level or it's not training, it's not advancing one's state of fitness. So reclaiming my strength and endurance meant hanging out well past my comfort zone--hour after hour, day after day for another 10 days. This 3rd reconditioning interval roughly translated into 30 of the last 70 days being spent in the uncomfortable arena of retrieving my strength and cardio-vascular fitness. In addition to the time spent on the bike being uncomfortable, time for post-ride walks had to be built in to my afternoon schedule to reduce the aches and pains in my legs. Staying disciplined about additional stretching and targeted massage of the most irritated tissues also helped ease the transition. And this year compression socks were an easy, new tactic to reduce my post-ride leg discomfort, whether I wore them during the ride, after, or overnight on the worst days. This 3rd round of reconditioning for the season had the unwelcome addition of also incorporating heat-acclimation into the mix. The restless, cranky waves of agitation caused by the heat had to be endured as a necessary part of the additional metabolic adjustment process. Ready and waiting for the arrival of the hoards. The discomforts of reconditioning as we left Pisa were eased somewhat by initially riding along a flat seaside pedestrian and bike promenade. When we rode much of this 20 mile stretch in early May of 2006 nary a soul was about; in late May of 2009 the place seemed ready to explode with tourist action. Few of the beach chairs were occupied but the sidewalks and parking lots were buzzing with activity. This year's visit was the perfect timing for us: there was enough of the beach scene energy in the air to sense the excitement but not so much for the congestion to be a hassle. Given I love being outdoors but try to limit my sun exposure and I'm not particularly fond of sitting still, I'm always baffled by the appeal in spending hours sunbathing in a lawn chair. But the crowds confirm that I am in the minority and the endless miles of beach facilities underscored that fact. 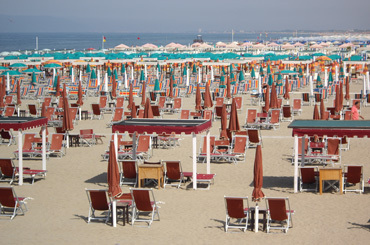 Little of the beach sand can be accessed without a hefty charge in this area and just like the hotels and restaurants, the beach facilities on the Italian Riviera are rated on a 5 star system. Cabanas, covered parking, and salt water swimming pools were the snappier features evident from the road and no doubt a closer inspection would reveal other important attributes for the experienced guest. Ruins of yet another Roman coliseum in Italy. As when crossing from the east to the west coast before heading to Malta, Bill again searched for sightseeing destinations along our northern coastal route. 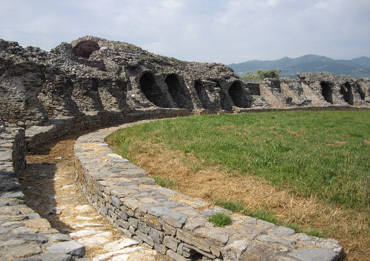 We ducked into an old Roman city, Luni, near Carrara of marble fame. There is rarely much new for us in Roman archeological sites but we always love the museum exhibits for the Italian vocabulary lessons. Along with collecting a new batch of words, we were fascinated by the drawings of post-Roman production of rock containers used for cooking and metallurgy. We were able to decipher enough to understand that a special rock that was found at a specific alpine elevation and then brought down by glaciers was the prized starting material. A water powered lathe was used to slowly carve-out a central core from a lump of rock that could then be popped out with a well-levered 'whack'. Unfortunately no photos of the museum were allowed. It was a fine day for a 'high-road' view of a Cinque Terra village. Easy cruising along the miles and miles of beachside promenades quickly gave way to wildly difficult riding as we approached the Cinque Terra region of the northwestern Italian coast. We'd traversed the 'high road' through the "Five Lands" before and loved the views despite the many extra miles ridden because of inaccurate maps. Still far from our peak form, the bouts of 12% grades brought us to our knees this year but we knew from our prior experience that they wouldn't go on for the entire day. Plans to linger for a little hiking in the Cinque Terra area from the larger town of Levanto just northwest of the park were dashed when we discovered that we'd once again fallen victim to the collision of Italy's Republic Day and the 2 week long holiday triggered by Pentecost in the German-speaking/Catholic regions of Switzerland and Germany. There was no lodging to be had after the next 2 nights for miles around. We felt lucky to find a place to stay before the holiday gripped the area and devoted an entire day bracketed by our 2 nights to online searching and making calls to find any place to light. How sad to be in such a lovely area and to spend the day indoors attached to our electronics. We finally resorted to our new trick to find lodging during holidays and which was to head for the nearest mega-city, Genoa. We were able to book a room for the long holiday weekend at a 4-star hotel that had slashed its prices because this weekend was a must-do at the beach, not the city. 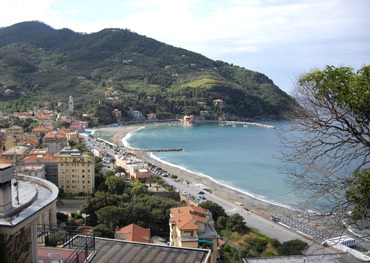 Pretty Levanto was where we hoped to base for hiking. Bill crafted a plan in which we took the train for about 30 miles on each side of Genoa to avoid the difficult traffic conditions that we knew dominated the area. 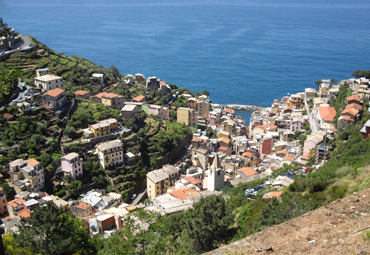 And instead of hiking in trendy Cinque Terra as we'd hoped, we maintained our conditioning by riding our bikes up into the steep mountains that form a dramatic backdrop to Genoa. Unfortunately it was a cold, drizzly holiday weekend for all of us but at least we had a comfortable place to stay. We keep refining our class of travel and our 2009 season revealed that Map Man baulks if he can't book lodging along a remote route with the aid of a cell phone and good internet access. The combination was a powerful duo for us a year ago in Sicily where we gradually tumbled to the fact that B&B's were the best way for us to find lodging outside of the region's cities. But the catch was that the B&B's didn't advertise on paper; many only marketed their abodes online. 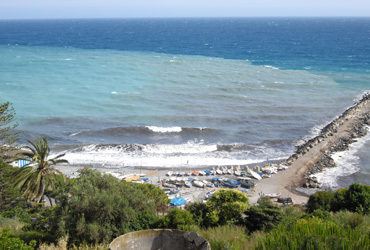 The new B&B niche in Sicily was a lucky find for us especially since cell phone service was cheap and easy for visitors to obtain in Italy and Bill's new-for-2008 set-up for accessing the internet on our laptop via his special cell phone was inexpensive there as well. Because of this happy pairing of B&B's and cell phones, part way through our 2 month tour of Sicily our trip planning did an about-face and almost all of our lodging was reserved at least the night before by searching the web and then making a call. Our usual mode for years had been to look for a place to stay once we arrived in town. The increasing use of online marketing by small-time lodging hosts in Italy encouraged Bill to tackle a route through the less-well serviced Maritime Alps of France this year. His successes in the last 12 months in Italy, Croatia, and Montenegro emboldened him to go where he'd dared not go before....but there was a problem ahead....we would be in France. In 2008 we declined cell phone service in France as it was still too expensive, too cumbersome. In other countries, we could get through the cell-phone-service door for $10; in France it was more like $100. And internet access via cell phone just wasn't going to work in France, unlike in most other countries we were visiting that year. But 1 clerk last summer had reassured us that things were changing in France and maybe in 6 months the service structures would support visitors instead of only folks contracting for a year of service tied to their land line phone. Menton, France looked different from Italy a mere mile away. While still in Italy this year, Bill used the his Italian internet connection to check for cell phone service shops on his mountain route into the Maritime Alps and there would be no such vendors on the French side until late into the first week of touring. That wouldn't do, as we'd need to be confirming lodging in this relatively isolated area on a day-by-day basis. Given the lack of cell phone service retailers on his French route, Bill changed his attack on the Maritime Alps. It would be preceded by a special day trip into seaside Menton, France for the sole purpose of getting a SIM chip for his phone and also hoping to be able to subscribe to an internet service. We laid over an extra night in an affordable village in coastal Italy that was 12 km or about 7 miles from Menton, the French city closest to the border. Half was better than nothing and we left Menton with the necessary mobile phone access but no internet service to support our stay. The in-the-door cell phone chip prices had indeed come down in France but were still triple what we often pay to obtain service and the per minute charges were the highest we'd had to pay too. But at least we'd be able to call ahead for reservations with our own phone as B&B's rooms never have a guest phone and usually our budget hotel rooms lack a phone also. The cell phone-internet chores didn't take long so we made a day of it in Menton with additional shopping and sightseeing. The increasing discomfort in my shoulder, presumably after too much rest in Malta, had me recently wiping out our year's supply of ibuprofen and at almost 50¢ a tablet in Italy, I was ready to do some price-shopping in France. Since we were literally straddling the border for a day, I still had the opportunity to stock-up in which ever country had the best price. We also loaded ourselves down with a week's supply of bulgur for our hearty breakfasts in the mountains, a food item that was harder to come by in Italy. My favorite sunscreen is made in France and indeed, it was cheaper to resupply while in resorty Menton on an item we likely wouldn't find in the mountain villages. No thunder but the water turned gray from the storm churned sand. The sign for the prehistoric museum in Menton turned our heads and after the serious business of the day was tended to, we headed for the small museum. Luckily the afternoon thunderstorms didn't materialize so it was easy to take turns sitting with the bikes and touring the museum. The exhibits were quite dated but we enjoyed a refresher course about the regional finds that clustered around 1 million years ago; 400,000 years ago; and about 30,000 years before present. We have learned that a lot has changed in the last 10-20 years in the accuracy of dating archeological finds and some long-standing professional disputes have also been resolved in that time, so the information in older exhibits like Menton's have a high obsolescence factor. But as always, we were thrilled to linger for an hour amidst prehistoric finds. With a French chip for our cell phone; new maps; and a stash of bulgur, ibuprofen, and sunscreen from France and chocolate bars and pesto sauce from Italy, we were ready to head into new-to-us mountainous territory, the Maritime Alps. 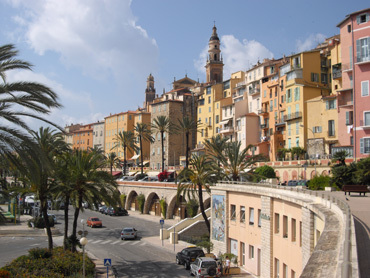 Our stay would largely be on the French side, so the day trip into Menton also helped Bill dust-off his French language skills that were buried under a thick layer of Italian and German. Our conditioning was just barely up to the challenges of these Alps and late snows left some passes as questionable, but we were eager for the next adventure in our favorite cycling area, anybody's mountains. We feel like are putting down roots in Selva di Val Gardena even though we'll be on our way on Saturday. High season arrives then, so we'll be leaving. Today is day 10 here and yesterday was the first warm, sunny day. The daily threat of thunderstorms kept us off the Via Ferrata (Iron Way) hiking routes until yesterday when we wore ourselves out on one that starts fairly close to our apartment. Saturday and Sunday nights will be spent in a mountain hut so we can do a Via Ferrata on Sunday that it normally out of reach for us. Then on Monday we'll bike over a nearby pass to lower-priced Corvara and hike from there for the better part of a week. Bill has been busy crafting a biking/hiking meander from there that will include an area in Austria that will require some punishing passes to reach.